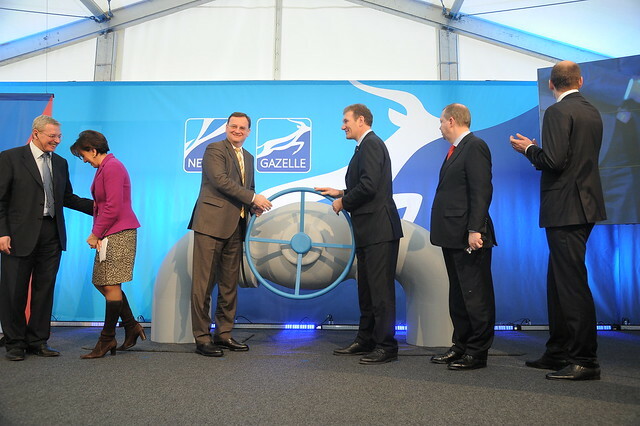 The around 166 kilometres long connection piece GAZELLE strengthens gas supply in the European Union and ensures security of supply in the Czech Republic and its neighbouring countries. Přimda, 14 January 2013 – The gas pipeline GAZELLE was solemnly inaugurated today by the Prime Minister of the Czech Republic, Petr Nečas, Anne Ruth Herkes, Secretary of State at the Ministry for Economics and Technology of Germany, Anatoli Borisovich Janovskij, Secretary of State at the Ministry for Energetics, representing the Chairman of the Government of the Russian Federation, the CEO of RWE AG, Peter Terium, and the CEO NET4GAS, Thomas Kleefuß. The initial putting into operation of the pipeline, whose completion completes the so-called ‘new Northern way’ for the transport of natural gas to Western Europe, was also attended by the ambassadors of both countries, the Minister of Industry and Trade of the Czech Republic, Martin Kuba, and Dr. Gabriele Stauner, Assistant Secretary of State, representing the Government of the Free State of Bavaria. The GAZELLE pipeline connects with the NORD STREAM pipeline in Brandov/Brandau in Northern Bohemia and the OPAL pipeline on German territory. Through the distribution hub Přimda upwards of the border checkpoint Rozvadov-Waidhaus, it is connected with the long distance gas pipeline network MEGAL, which supplies the South of Germany and France. The length of the new pipeline is 166 km and its construction began with the laying of the foundation stone of the Brandov/Brandau station in October 2010. It is an exclusively private investment project of the NET4GAS company valued at CZK10 billion, or €400 million, respectively. The construction of the GAZELLE pipeline was one of the priorities of the Czech Government, which voiced explicit support for the project in its Programme Declaration in August 2010 as part of efforts of a general diversification of energy resources and significant improvement of the energy security of the Czech Republic and European Union countries. In Brandov, Jirkov, Sviňomazy and Přimda, the GAZELLE pipeline is connected with the existing long distance gas pipeline network of the Czech Republic. The 166km long GAZELLE pipeline has an transport capacity of around 30 billion cubic metres per annum (bcm/a). This quantity is sufficient to supply the Czech gas market for three years, or alternatively, it corresponds to one third of the German market. In order to realize this project, NET4GAS had to reach agreements with more than 1,035 property owners. In peak times, more than 600 people were employed at the construction site in the Czech Republic during the last two years. Starting today, Russian gas is flowing through the Baltic Sea to Germany, and is further passed on through the OPAL pipeline and our Gazelle pipeline to via Waidhaus into the MEGAL pipeline. This gas is used to supply large parts of Bavaria and eastern France. “In so doing, Net4Gas has thus once again demonstrated its ability to reliably react on market requirements in line with our corporate maxim “Connecting Markets”, and even to actively participate in the design of the market – and with our network, we have developed a hub for the gas markets in Western and Central Europe,” said Thomas Kleefuß, CEO NET4GAS, a subsidiary of RWE AG. “The GAZELLE pipeline is a new transport route for Russian gas, which further strengthens the security of supply in the European Union. Should gas supplies be interrupted in the Ukraine, GAZELLE is of strategic importance not only for the Czech Republic, but also for its neighbouring countries,” added Thomas Kleefuß. The completion of the new gas pipeline increases the capacity of the Czech transport system. For instance, supplies can now also be delivered to the Czech Republic using new, alternative routes such as the planned Nabucco pipeline. The GAZELLE pipeline largely follows the routes of already existing gas pipelines and will be connected to the existing Czech gas network. This is also meant to promote competition on the Czech gas market. NET4GAS is a reliable, strong and secure long-distance gas pipeline network operator who guarantees domestic and foreign partners availability of the transport capacity they need. All gas distributors are guaranteed non-discriminatory access to the gas transport system. NET4GAS s.r.o transports natural gas in the Czech Republic using a pipeline network that is 3,642 kilometres in length. Diese Website verwendet Cookies und legt sie auf Ihrem Computer ab, um das Angebot nutzerfreundlicher und effektiver zu machen. Um mehr über Cookies zu erfahren und Informationen darüber zu erhalten, wie Sie Ihre Cookie-Einstellungen ändern können, klicken Sie auf den Button "Datenschutzhinweise / Privacy". Bei weiterer Verwendung dieser Website, ohne Ihre Einstellungen zu ändern, stimmen Sie der Verwendung unserer Cookies zu. Log in | 167 queries. 1.065 seconds.